Well, thank goodness that Halloween is over. It seems to be so much work. But the kids love it! I had to work this year, at my NEW job, so Daddy got to have the fun of TOTing with the girls. They had a great time. And got WAY too much candy! But that is just my opinion....haha. On Halloween night, Katie marched in the annual Edwardsville parade. She did a great job! so funny to watch her. It brings back so many memories!!! 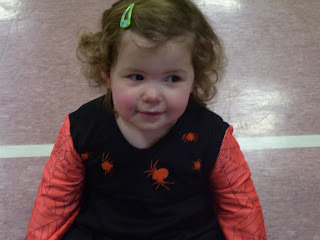 Allison didn't quite understand what was about to happen, but she loved the dressing up stuff. This one is for you, Grandma Brooks. 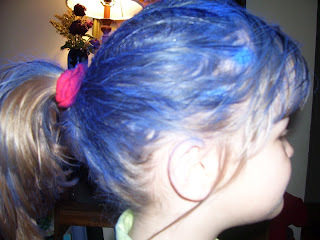 Emily got to have the bluest of hair. She had more fun washing it out, making the shower water blue. 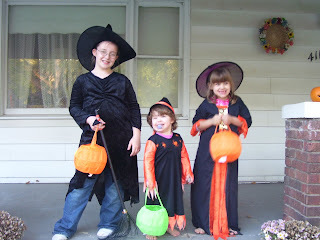 Here they are...the cutest witches around. 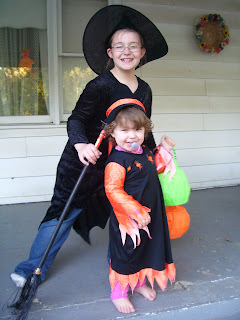 Seriously...have you ever seen cuter witches? 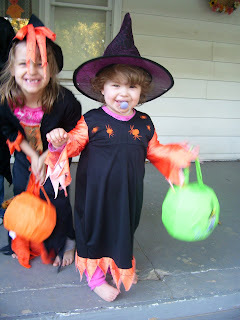 Ami, the girls are too cute in their Halloween costumes! Thanks for sharing the pictures.